Be warned, if you haven't seen the sci-fi thriller Gravity yet, there will be plenty of spoilers throughout this story. 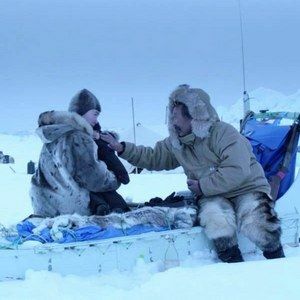 Gravity co-writer Jonás Cuarón, the son of director Alfonso Cuarón, has written and directed a seven-minute short film entitled Aningaaq, which ties into the blockbuster that just passed $500 million worldwide. This short shows us the other side of Dr. Ryan Stone's (Sandra Bullock) distress call made from the Russian space station, where she makes contact with a man speaking an unidentified foreign language. Aningaaq centers on the Inuit fisherman in Greenland who answers her call. Check out the video, then read on for more information. The short film was initially set to be included in the Gravity Blu-ray and DVD release, but now, after festival screenings in Telluride and Venice, Warner Bros. is submitting Aningaaq for Oscar consideration in the Best Live-Action Short category. If both Aningaaq and Gravity are nominated, it would be the first time that both a feature and short derived from the same material are nominated in the same year. The $100,000 film was financed by Warner Home Video, with Jonás Cuarón shooting "guerrilla style" on location in Greenland, with most of the budget covering travel costs for the 10-man crew. The title character, played by Greenland's Orto Ignatiussen, was based on a drunken native whom Alfonso Cuarón met during a trip to the region. In fact, Alfonso Cuarón once toyed with setting Gravity in that region. The initial idea came when they were still working out the story beats for Gravity. Here's what Jonás Cuarón had to say about that pivotal moment in Gravity. "It's this moment where the audience and the character get this hope that Ryan is finally going to be OK. Then you realize that everything gets lost in translation." Jonás took off on a two-week journey to gather elements for his film, where he was inspired by the locals attachment to their sled dogs, an element that made it into the plot.